Formerly known as 'Totalise PLC' and now as Madasafish (Brightview was then parent company of Madasafish), it was one of the first small, independent ISPs. It's first users even received free shares in the company back in DotCom boom!! Suffice to say, I didn't get any richer from that. MAAF then became part of Plusnet. More negatives, than plusses though. "Thanks for getting in touch, sorry to hear you're having some problems with the transfer. Unfortunately as the domain has been provided without cost for the entire term we charge a £25 fee to transfer this out. I'm afraid we're unable to waive this or reduce the cost." Of course I'd paid for the domain indirectly. Nice try! "Again, I apologise that you are unhappy with the charge. This charge is applicable as we would have to pay to transfer the domain to another host and this cost also covers the administrative work that we have to perform for the transfer." Yeah right! Many ISPs/providers will do this for free these days or charge a nominal fee of 10 pounds. Luckily there's another way to transfer your domain to a new registrar and that's via Nominet. For a nominal fee of 12 pounds they will do it for you. So that's what I did! Transferred to Hear Internet, set up my account and within 45minutes of instructing Nominet, I'd set up my account with Heart and was able to login and update my DNS records. All for 15pounds per year (+VAT)!! Not a bad proposition - hopefully there won't be any downtime or slow response issues. 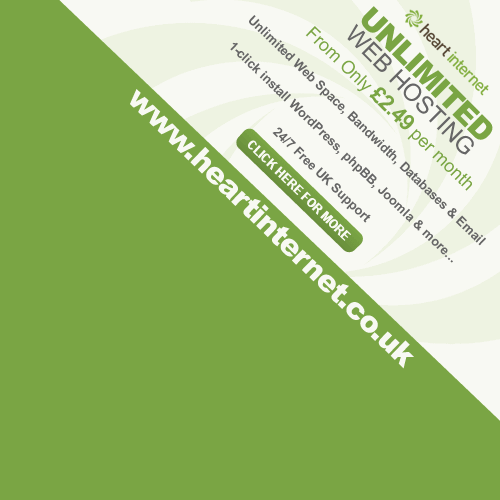 Domain (Heart Internet) 3.60 (One of the cheapest UK deals I have seen on internet domains).